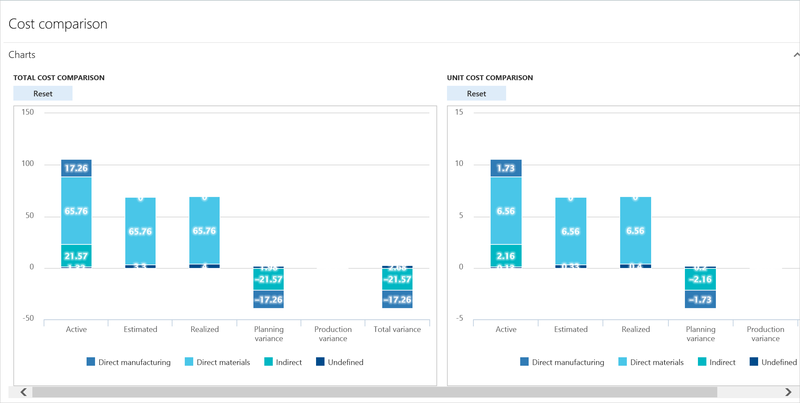 This topic will help you build a walkthrough of subcontracting in manufacturing in Microsoft Dynamics 365 for Finance and Operations. The first part of this topic describes the setup of the data. The second part takes you through the steps in the walkthrough. In this topic, you will learn how to set up subcontracting in manufacturing. You will use existing data in the HQUS legal entity to do the basic setup of a subcontracting activity flow. The demo data in the HQUS legal entity includes setup parameters that have been preset to support the steps in the walkthrough. Even though the walkthrough addresses key pain points and challenges for various roles, it can be completed by the system admin. In the HQUS legal entity, high-end speakers are manufactured. During the manufacturing process, speakers go through the following three operations. Pre-assembly – The speaker cabinet is assembled. The material for the cabinet is picked in the material warehouse before the operation is started. Coating – After the speaker cabinet has been assembled, it must be coated. This operation is completed by a vendor (subcontractor). The pre-assembled speaker cabinet is shipped to the coating subcontractor together with two materials. Finish – After the pre-assembled speaker cabinet has been coated by the subcontractor, it's returned to the HQUS legal entity so that final assembly of the speaker can be completed. The following illustration shows the three operations and the materials that they consume. Before you start the walkthrough, you must set up the data. This procedure takes you through the setup of released product D8100, "Coated Cabinet." 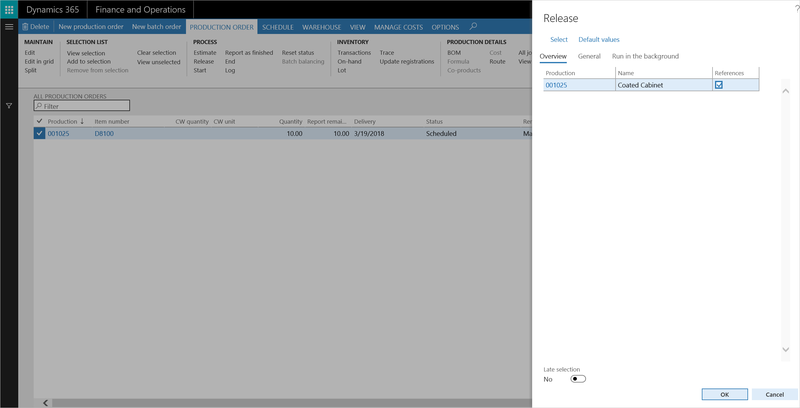 Select Product information management > Products > Released products to open the Released product details page. In the quick filter field, enter D8100 to find the existing released product. 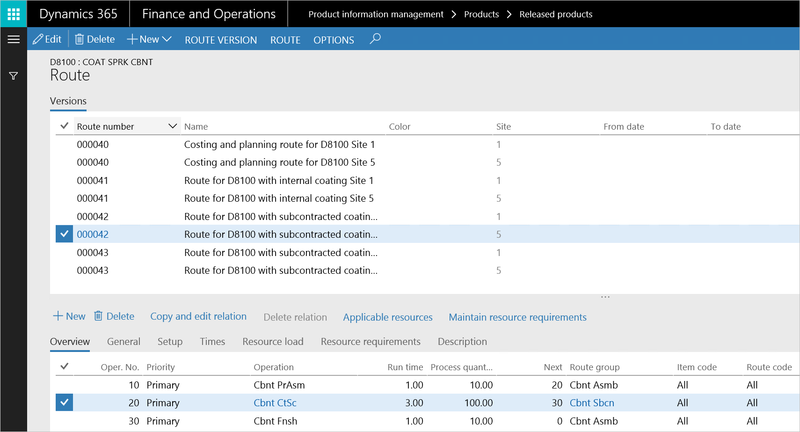 On the Action Pane, on the Engineer tab, select Route to open the Route page. 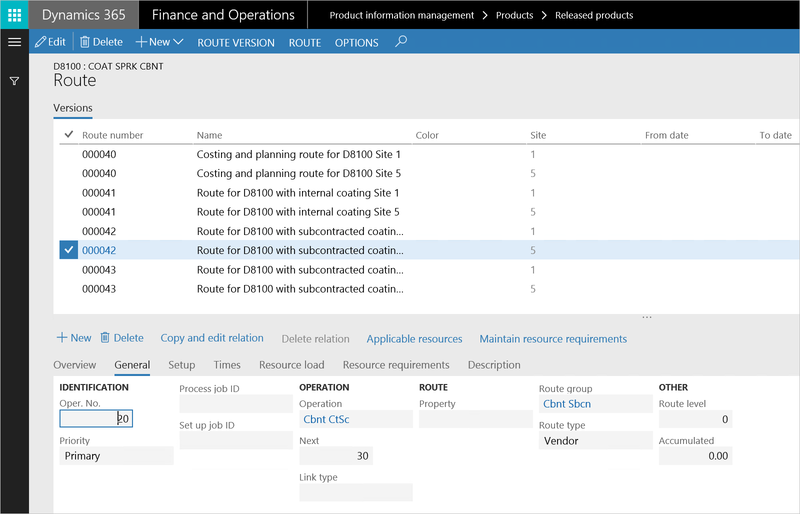 The Route page shows the eight route versions for released product D8100. The eight route versions are divided among four routes on site 1 and site 5. Route 000400 is used for costing, route 00041 is used when the Coating operation is an internal operation, and route 00042 is used when the Coating operation is an external operation. In the upper pane, in the Versions grid, select route version 00042 for site 5. In the lower pane, on the Overview tab, select operation 20 (Cbnt CtSc) in the grid. Notice that the field Route type field is set to Vendor. This value indicates that operation 20 (Cbnt CtSc) is a subcontracted operation. Select the Resource requirements tab. 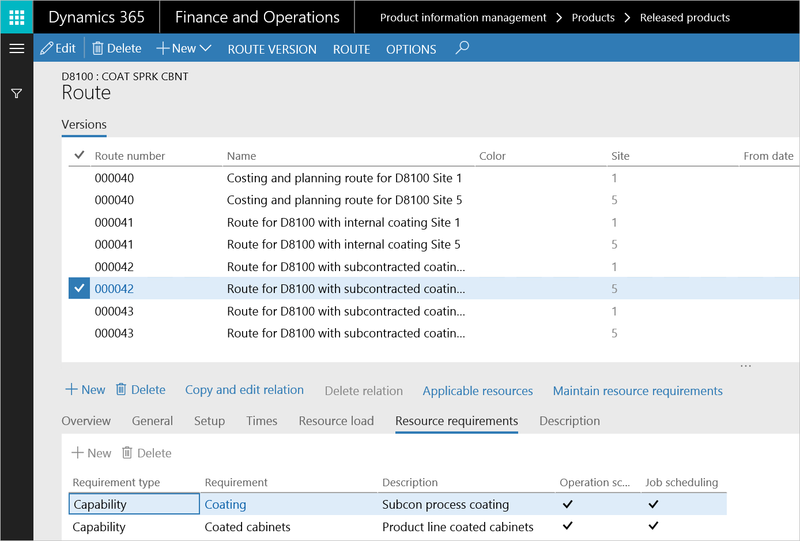 Capabilities will be used to find an applicable resource during production scheduling. For operation 20 (Cbnt CtSc), notice that a resource that has two capabilities, Coating and Coated cabinets, is required. Select Applicable resources to open the Applicable resources dialog box. Three resources are found that match the resource requirements for the operation. Notice that resources 8851 and 8852 are of the Vendor type. Select OK to close the Applicable resources dialog box and return to the Route page. Close the Route page to return to the Released product details page. On the Action Pane, on the Engineer tab, select BOM versions to open the BOM versions page. 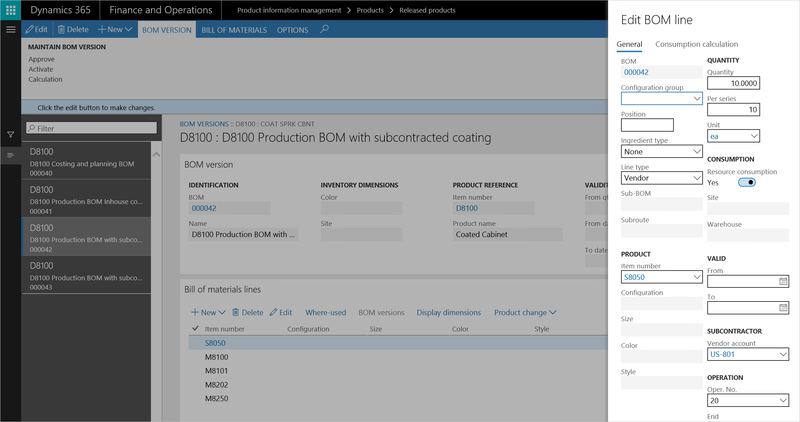 The BOM versions page shows the four bill of materials (BOM) versions for released product D8100. BOM 000040 is used for costing and planning, BOM 000041 is used if the Coating operation is done in-house, and BOMs 000042 and 000043 are used if the Coating operation is subcontracted. Notice that item S8050 is a product of the Service item type. This item represents the subcontracted work. On the Bill of materials lines FastTab, select Edit to open the Edit BOM line dialog box. When a production order is created and estimated for released product D8100, a purchase order will be automatically generated for item S8050. This purchase order will be linked to the production order. For purchase orders to be automatically generated, the Line type field must be set to Vendor, and the vendor account for the subcontractor must be selected. In this case, the vendor account is US-801. Notice that the BOM line is connected to the Coating operation through the operation number (in this case, 20). You must define a password for the warehouse workers who use the hand-held device. 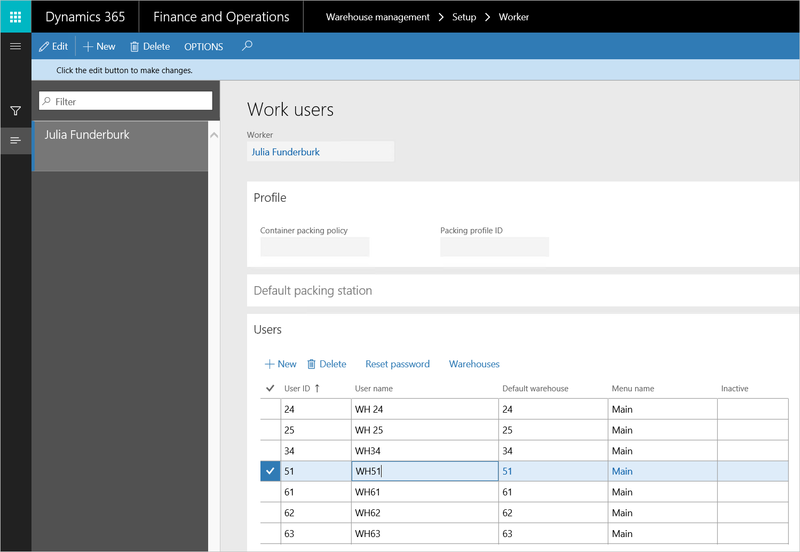 Select Warehouse management > Setup > Worker to open the Work users page. On the Users FastTab, select the row for user 51. In the Password and Confirm password fields, enter 1. A production order of 10 pieces is created for product D8100, "Coated Cabinet." The coating of the cabinets is a sub-contracted operation that is done at vendor US-801, Perfect Coating Solutions. The production order consists of three operations. In the first operation, the cabinet is pre-assembled as an in-house operation. The material for the pre-assembly is released for picking in the raw material warehouse. After the pre-assembly is completed, the pre-assembled cabinet is sent to Perfect Coating Solutions together with two materials that are required for the Coating operation. When the coated cabinet is received back from the vendor, it goes through a final in-house assembly operation before it's reported as finished. 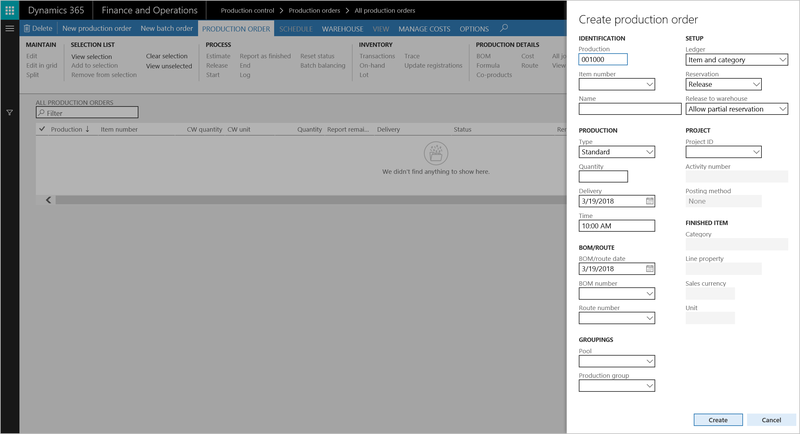 Select Production control > Production orders > All production orders to open the All production orders page. On the Action Pane, select New production order to open the Create production order dialog box. In the Item number field, select D8100. After you select the item number, fields for the inventory dimensions appear. In the Color field, select Chrome. A message box appears that asks whether the active versions for the BOM and route should be inserted. In the Create production order dialog box, the active versions of the BOM and route for product D8100 are automatically selected in the BOM number and Route number fields, respectively. In this case, BOM 000040 and route 000040 are selected. For both the BOM and the route, version 000040 is used for costing and planning. In the Site field, select 5. In the Warehouse field, select 51. In the BOM number and Route number fields, change the value that was automatically selected to 000042. For both the BOM and the route, version 000042 is used to subcontract the coating of the cabinet to vendor US-801. 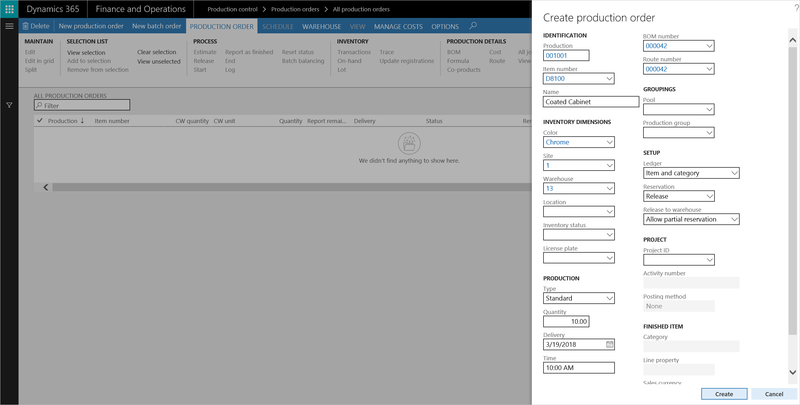 Select Create to create the production order and return to the All production orders page. On the Action Pane, on the Production order tab, select Estimate to open the Estimate dialog box. 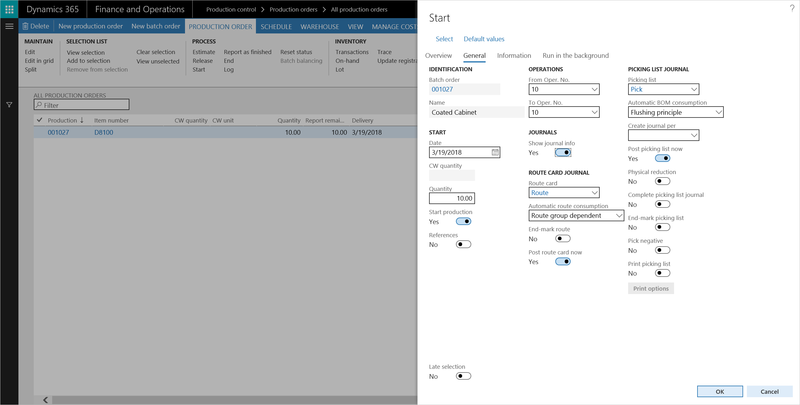 Select OK to confirm the estimate and return to the All production orders page. When the production order is estimated, the purchase order for service item S8050 is generated for vendor US-801. 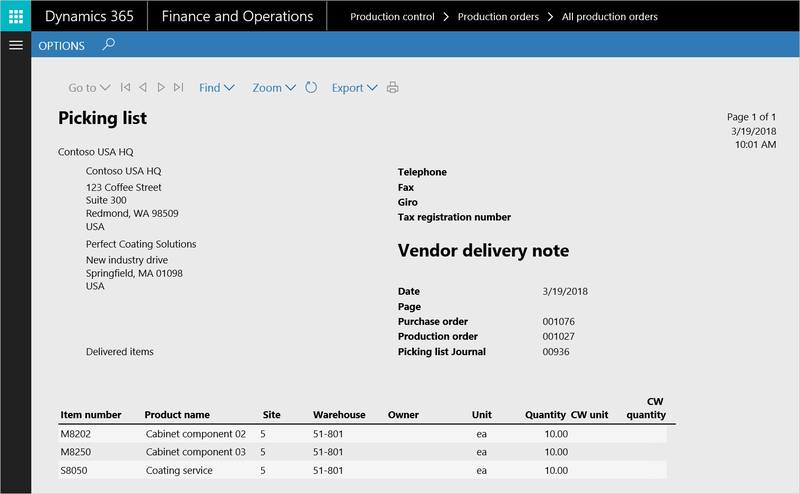 On the Action Pane, on the Production order tab, select BOM to open the BOM page, where you can view the BOM lines for the production order. 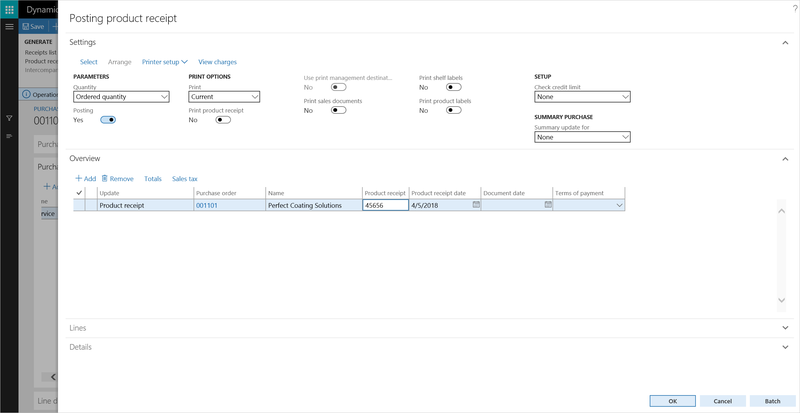 For service item S8050, notice that there is a reference to the purchase order that was generated when the production order was estimated. Close the BOM page to return to the All production orders page. On the Action Pane, on the Schedule tab, select Schedule jobs to open the Job scheduling dialog box. In the Scheduling direction field, select Forward from tomorrow. Set the Finite capacity option to Yes. Select OK to close the Job scheduling dialog box and return to the All production orders page. On the Action Pane, on the Schedule tab, select Gantt to open the Gantt chart - Resource view page. The Gantt chart provides a visual overview of how the production jobs are scheduled on the resources. Notice that the external Coating operation consists of three jobs: a process job, a transport job, and a queue time job. 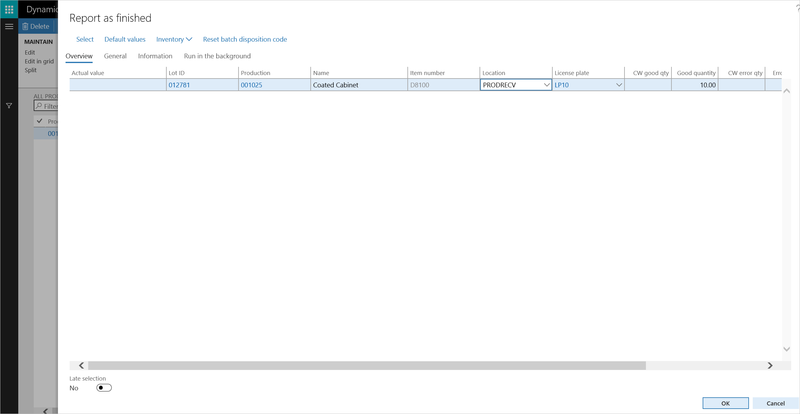 Close the Gantt chart - Resource view page to return to the All production orders page. On the Action Pane, on the Production order tab, select Release to open the Release dialog box. Select OK to close the Release dialog box. Select Production control > Periodic tasks > Release to warehouse > Automatic release of BOM and formula lines to open the Automatic release of BOM and formula lines dialog box. Select OK to run the Automatic release of BOM and formula lines job. This job releases pick work for raw materials to the warehouse. Use the quick filter field to select the production order that you've been working on. 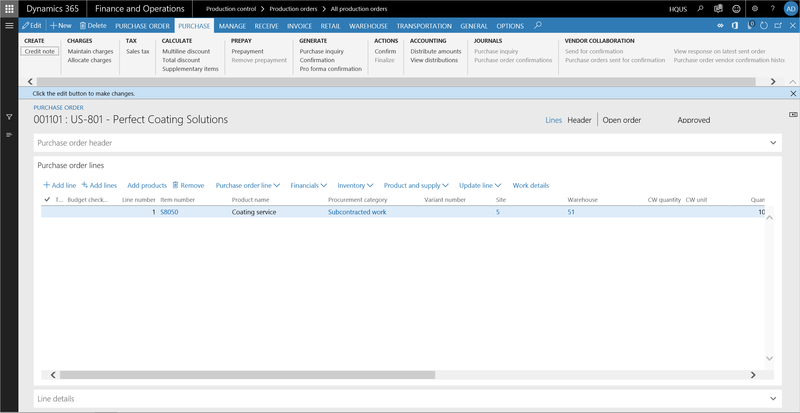 On the Action Pane, on the Warehouse tab, select Work details to open the Work page. Notice that the page shows two sets of work for raw material picking. The first work is for materials M8100 and M8101. These materials are consumed by operation 10. The second work is for materials M8202 and M8250. These materials are consumed by operation 20, which is the subcontracted operation. Start the warehouse app to process the warehouse work for operation 10. On the Action Pane, on the Production order tab, select Start to open the Start dialog box. In the From Oper. No. field, select 10. In the To Oper. No. field, select 10. 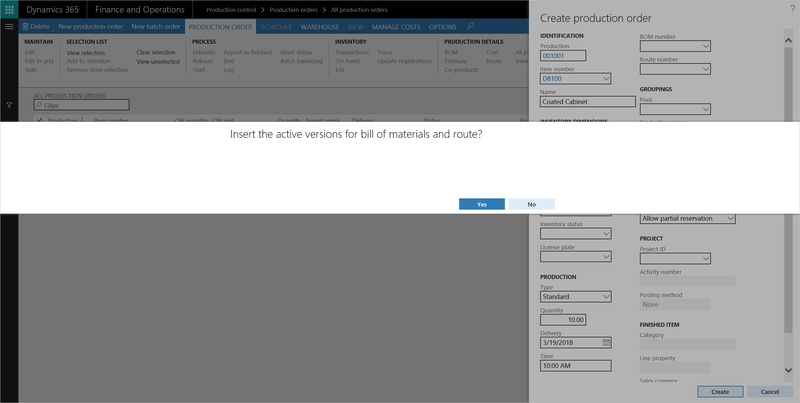 Select OK to close the Start dialog box and return to the All production orders page. Notice that the status of the production order is now Started. The materials for operation 10 are consumed by an automatic posting of the picking list journal. Time consumption for operation 10 is accounted for by an automatic posting of a route card journal. Start the warehouse app to process the warehouse work for operation 20. In the From Oper. No. field, select 20. In the To Oper. No. field, select 20. In the Quantity field, enter 10. Set the Post picking list now option to No. A picking list is created for the materials that are used for the Coating operation, and for the service item. The service item represents the cost of the subcontracted operation. On the Action Pane, on the View tab, select Picking list to open the Picking list page. Select the picking list that isn't posted, and then select the journal number to view the journal lines. On the Action Pane, select Print > Picking list report to open the Picking list report dialog box. Set the Use delivery note layout option to Yes. Select OK to generate a Picking list report. In this case, a vendor delivery note is printed from the production picking list journal. The delivery note specifies the materials that are shipped to the vendor who will do the Coating operation. Close the Picking list report to return to the Picking list page. On the Action Pane, select Post to open the Post journal dialog box. Select OK to close the Post journal dialog box. On the Action Pane, on the Purchase tab, select Confirm. Select Post to open the Post journal dialog box. Select OK to close the Post journal dialog box and return to the Purchase order page. Change the unit price from 33 to 40. Confirm the purchase order again.